Sci-Fi fever takes grip as alien ship crash lands in Sittingbourne High Street. Home / Blog / Sci-Fi fever takes grip as alien ship crash lands in Sittingbourne High Street. 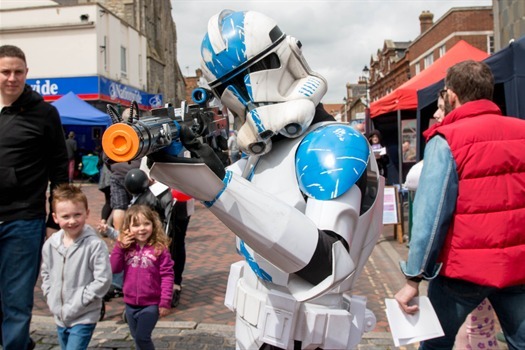 True to their word, The Swale Arts Forum initiated an invasion of Sittingbourne and hundreds of people came from far and wide to visit the extraordinarily successful Sci-Fi event. A huge rocket which actually billowed smoke formed the center piece of the event in the High Street. Created especially for the event over six weeks by local artist Tony Sanger, this set the scene for everything that followed. Besides the many stalls lining the High Street the event also occupied the large hall in the Swallows Leisure Centre. I can’t quite comprehend just how the Swale Arts Forum managed to scale up the event so much in a single year. There was a 30 foot Stay Puft Marshmallow Man from Ghostbusters stationed outside of Natwest and a DeLorean accompanied by a cast of familiar faces from the Back to the Future trilogy of films including Biff who did three costume changes throughout the day. One of the more popular attractions was Pete the T-Rex who at selected intervals took a little stroll along the High Street and on one occasion into the Swallows. Everywhere Pete went, he was surrounded by crowds of people, I think his keeper probably spent more time fending off the crowds than restraining Pete from eating little children. The 501st Legion of Stormtroopers were amazing and thanks for that great intro they provided on our video. There were also a great number of Pirates curtsey in the main to Black Pearl and the Pirates. At times it was difficult to tell who was a visitor and who was a guest with so many people turning up in costume. In the Swallows there was a roll call of actors who have featured in Doctor Who, Star Wars and Harry Potter including Paul Redfern, Oilver Barry-Brook, Peter Roy, Chris Parsons, Martin Ballantyne and Chris Bunn the original stormtrooper who I met at the previous event. There were also guest authors Matt Shaw, Kit Cox and Luke Smitherd and guest artist Grant Perkins who I also met last year and I recommend that you check out the previous year’s video if you want to find out more. I should also mention Michael Maxted who constructed a Giant 15 foot Thunderbirds 3 model in the space of just one month, which he told me has posed some issues in getting it to fit inside some venues. It’s a real iconic piece and Michael has plans to join it with an equally sized Thunderbird 1. Now my best laid plans didn’t entirely work out, first I did a brief interview with Michael Maxted with a perfectly focused Thunderbirds 3 and two blurry figures in front of it and secondly I managed to yank out the microphone filming a brief clip with the Dulcima's Delights who provided an Alice in Wonderland tea party complete with all the characters. Their costumes and make-up were amazing, very professional indeed. There was also a costume competition which featured amongst the winners the 1St Murston and Bapchild Scout Group with their very clever Jellyfish umbrellas. There was also a parade led by Big Fish Arts. It was an amazing day featuring many more characters, props and stall holders than I can possibly mention here including two Dalek’s, a Tardis, a Stargate, Darth Vader and so much more. If I didn’t mention you I’m sorry. I really wish I had the time to meet everyone but sadly it wasn’t possible.